Users must have a login for the Arena Web Portal pages. The Service List View page exists behind the Members Homepage and requires the user to be logged in. The VolunteerRequestYesUrl and the VolunteerRequestNoUrl organizations settings should also have a valid value pointing to the new Volunteer pages on the web portal. For services to display in the Serving Opportunities data display, the service position must be marked to Allow Signups. 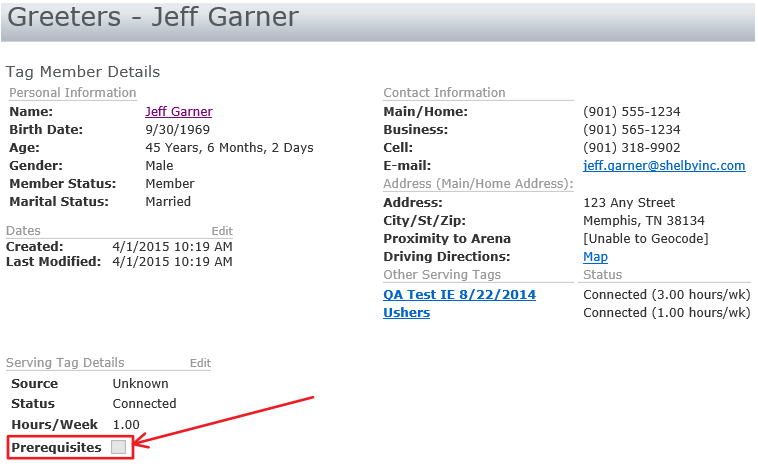 Click the Edit icon for a position to check that the Allow Sign Up option is selected in Arena (portal 1). Positions marked as Prerequisites Required requires that the volunteer signing up for a position to be marked on the service’s serving tag as prerequisites being met on the Tag Member Details. If a service is marked Prerequisites Required and a user attempts to sign up for the service but they have not been marked as having met the serving tag prerequisites, they receive an error message on the Save Member pop-up and the Ok button is disabled.